TVC Office - Day # 29 - SRO! Saturday, August 30th, was everything I thought it would be and a little bit more. When I reported for duty around 7:50 am there was already a gathering crowd of customers waiting for the double glass doors to open at 8 am. I immediately began to get my terminal up and running, but discovered a problem with the print queue left over from the day the technician attempted to integrate the new Ricoh copier/printer/fax/scanner into our network....it was loaded with a bunch of print jobs that were sent to the old printer, which is no longer connected to the network. Ultimately I had to reboot the computer to clear the print queue. By the time I got the computer back up and logged into DigiRez (our reservation/office management system) the line was 3 deep in front of me. Initially there were three of us.....Billy, Duane and myself.....working through the customers. Finally by 9:30 things had quieted down and I went out to check on the late arrivals left over from the night before (Billy kept the office open until midnight to whittle down the list from 50 to 25). The list of 25 late arrivals was the longest I have seen the entire summer, and it took me the better part of an hour to run through the list one time......an hour is usually all the golf cart can handle before it must be plugged back in, but what I didn't know was Wes (our resident electrician and all around master of many trades and talents) had replaced two of the six golf car batteries and then reconditioned the lot of them. As I was pulling up to the office to dutifully plug the golf cart back in Wes called out my name and told me not to plug it in....wait, what? Then he told me what he had done.....as it turned out the golf cart ran strong all day long, and was still going strong at 5 pm when I ended my shift......what a nice surprise, and on one of the busiest days of the summer when we really needed to use the cart a lot. 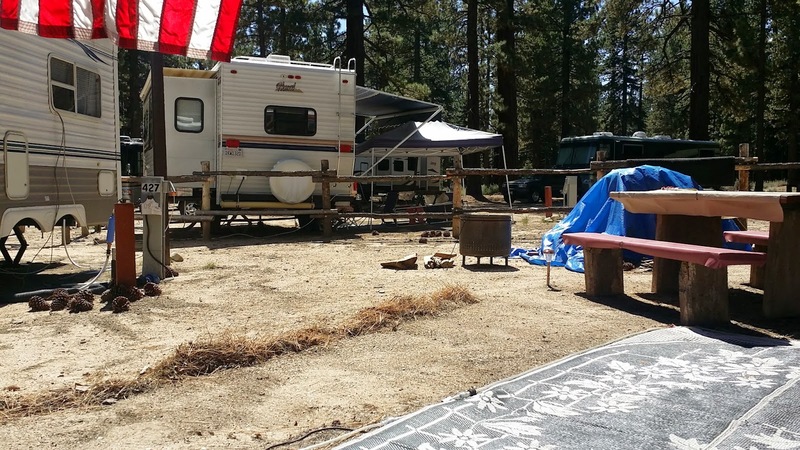 By 11 am there were zero tent sites available and only a handful of RV sites left, so we began selling tent sites in our "overflow" area, which cost the same as the regular tent sites, only you cannot do ANY cooking, have a fire, or even smoke a cigarette out there. 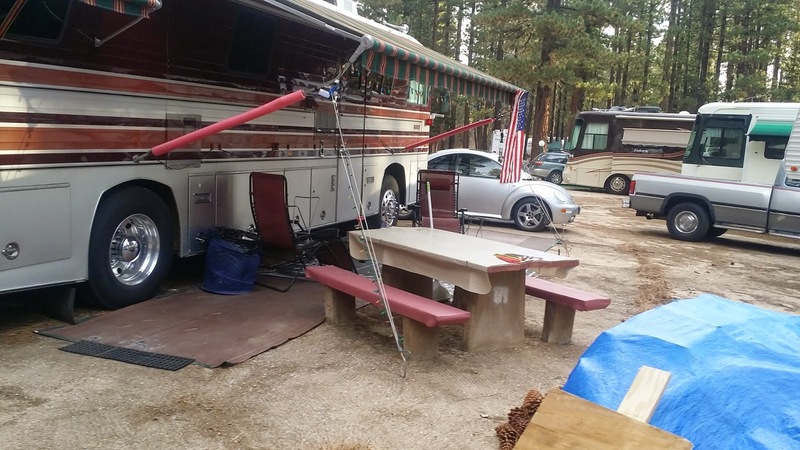 Usually people who decide to pay the $49 per night are willing to do so because there is NOTHING available anywhere else in South Lake Tahoe....all they really want is just a piece of ground to pitch there tent and sleep. In relative terms it is less expensive than paying $200-300 a night for a marginal motel room. As of the end of business on Saturday the campground was pretty much SRO (standing room only) and we are now extremely short timers.......2 full days left in paradise, and moving on to paradise by the ocean. Chris and Cherie (Technomadia) have been playfully taunting us by posting pictures of the coastline view from Cape Blanco Lighthouse since they arrived a few days ago. Sunday we will take down our awning lights, pull up the old, ratty awning mat whose service is fast coming to an end, and run the coach over to Raley's fuel station to take on at least 30 gallons of fuel at $3.59/gallon (utilizing our .50 cent off per gallon coupon, of course). Originally TLE and I were scheduled to work Saturday, August 30th, but TLE noticed they were understaffed for Friday so volunteered to move her work day to Friday....that left me on my own, and so grateful I didn't have to work Friday. According to the office computer there were 224 arrivals scheduled.....needless to say it was a madhouse. I began my morning a little after 8 am.....time to check the air pressure in all 10 tires (4 on the trailer and six on the coach)....it's been almost 4 months since that was done, but surprisingly, only one tire on the trailer needed just 3 pounds of air pressure, and each of the coach tires only about 5. Next up was to clean the portable fireplace and put it away, then check the generator.....yep, it still starts! Had to top off the coolant, and add a quart of oil, and then spent about an hour removing six month's worth of bugs, and road gunk. Then it was on to my "favorite" part of the day......cleaning the coach and trailer exteriors. 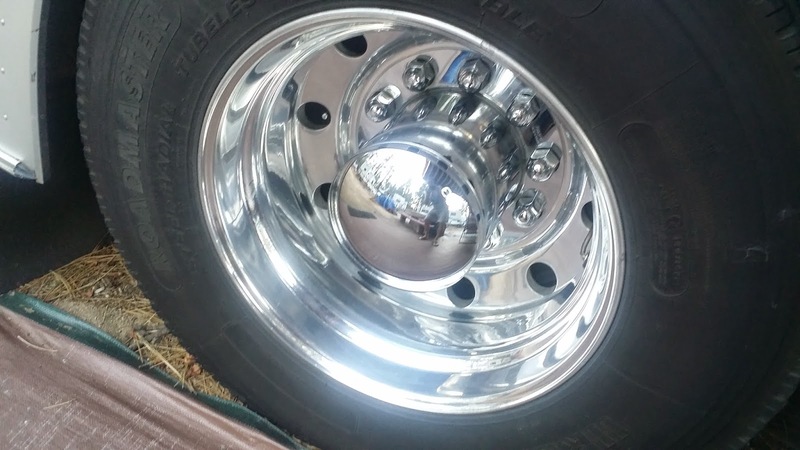 Fortunately the wheel covers did their job and all I had to do was wipe 4 months worth of dust off the Alcoa rims, and then the hard part began.....polishing up 100's of square feet of painted and anodized aluminum. Around 2:30 I ran out of gas, and was, as you might imagine, quite filthy so I treated myself to a longish hot shower. TLE was due home a little after 4 at which time our plans were to go out to eat in celebration of our aforementioned 43rd wedding anniversary. Since the workaday hoards are invading SLT this weekend we decided to get an early start. I asked TLE to make the decision on where she would like to go, and after careful consideration chose Steamer's Fish Taco Friday.....you could have knocked me over with a feather! You would think after 43 years that I would understand that I married a "low" maintenance woman.....not that she doesn't like fine dining....she does indeed, but she loves simplicity most of the time. We arrived just at 5 pm to find the place still pretty empty, so we picked an outdoor table and placed our order.....a pitcher of draft beer, and 5 fish tacos please! Friday was a good day for getting things done, and remembering.....thanks for stopping by! I know this entry is supposed to be about what happened Thursday, but I must take an ever so brief break to acknowledge the significance of today, Friday, August 29th. Forty-three years ago Elaine Frances Houghtaling answered the biggest question in my life by saying "I do!". This is the fourth anniversary we have celebrated since we began living full time in our 1982 Newell Coach. On August 30th, 1971 we arrived in South Lake Tahoe for our honeymoon......and here we are once again in South Lake Tahoe.......5 children, two careers, and 43 years later. In some respects "43" seems like such an abstract number.......August 29, 1971 seems like a few lifetimes ago. We are not the same people who exchanged vows 43 years ago.....we were both just shy of our 22nd birthdays the day we were wed, and were still maturing and becoming who we would become. We managed to continue loving each other through all the changes and maturation process......that we were good friends prior to becoming romantically involved was the glue that kept us together through "thick and thin"....sometimes pretty thin.......but, today we are as "thick as thieves". August 29th is also my father's birthday adds another level of specialness to this day. Happy anniversary my "Lovely Elaine", and happy birthday Dad.....I know you are looking down and smiling right now.....I can just feel it. Now, back to our regularly scheduled programming......what happened Thursday? This was the second big day of putting stuff away.....while TLE took down the sunscreen and did some minor re-arranging in the through storage compartment I continued to find places to "squirrel" away more stuff in the trailer. While I continued my "squirreling" ways TLE headed off to get a haircut, and do "small" shopping. I removed the tire covers from the coach wheels, raked the large quantity of pine needles off the patio awning, and then raked the ground around the coach so we will track in fewer pine needles over our remaining 3 days. It may not look it, but it is almost ready for the VW! By 1 pm it was getting hot in the trailer, and outside too, so I decided to sit in the shade and read a book for a while.....of course that turned into another nap, but who's counting, right? Tomorrow I'll clean up the exterior of the coach, put a few more things away in the trailer (bikes, etc. ), check all tires for proper air pressure, put away the portable fireplace, and then we will be pretty much ready to roll Tuesday morning......early....I hope. After Wednesday there are no more "open the TVC office" shifts for me, so I can sleep in 30 minutes more....all the way to 6 am! As expected Wednesday was another slow day with just over 20 arrivals scheduled, and and equal number of departures. We arrived for duty at 7:30 am, and had the double glass doors open by 8 am. Ruth and Eric came on duty around 9:30, so we had 4 at the registration desk for most of the day, and not enough customers to go around. There was an occasional flurry of customers....some registering, some just dropping in to check out the campground, some who could not fit their RV in the assigned site, and some who had RV's to put in storage, or take out of storage. There are very few tenters in the campground right now....I can count them on one hand....but that will change starting Thursday and Friday. A few days ago we took delivery of a new Ricoh copier/fax/printer/scanner. The intent is that this one large apparatus will replace 2 laser printers and 2 fax machines that double as copiers. Wednesday was the day the technician would attempt to integrate the new machine into our network, and remove the other devices, however, as all hardware/software upgrades tend to go, this one didn't. They couldn't seem to get the correct printer drivers downloaded, and after 2 hours the effort was aborted, and the old printers/fax machines were hooked back up again so we could do business. They will come back after the Labor Day weekend and take a stab at it again. Hopefully, when we return next year it will all be resolved. Quitting time seemed to come quickly and we were out the door promptly at 4 pm with only two more work days left on our schedule. We will spend a lot of time Thursday, Friday and Sunday getting things put away in preparation for our early morning departure next Tuesday. Around 5:30 we tuned into Ustream.tv to watch a live presentation by Chris and Cherie of Technomadia fame on caravaning with friends, and how to do it. The last time we saw them in person was last summer in Polson, MT just after they had their Detroit Diesel 8V71 rebuilt. In just a few days now we will meet up with them again at Cape Blanco Lighthouse where we will be for the next two months. We watched "So You Think You Can Dance" before heading to bed.....I'm going for Valerie, the "tapper".....TLE thinks Ricky will win.....we'll find out next Wednesday evening. How are you voting? As we edge toward September one thing is already clear......it is getting darker earlier in the evening and staying darker longer in the morning, and now we are running both heaters in the morning to warm the coach up for human habitation. Other than a week, or two in the middle of July we have run at least one heater every single morning......that is a summer first for us, and actually quite pleasant when you give it some thought. I would rather run a heater an hour in the morning than AC all day long.....how about you? After the deluge Monday, Tuesday was quite sunny, although still very cold......again, my use of the term "cold" is relative......it's cold relative to say Palm Springs, or Phoenix, or Dallas. It continued to be extraordinarily quiet here at TVC, and no one is complaining....we all know what is coming in less than 48 hours.....the Labor Day Crush....and then it will be over just as suddenly as if you turned off a light switch. The park will empty out next Monday, and by Tuesday the pool and two of the four campground sections here will be closed for the winter. There were very few arrivals and departures Tuesday, and we had pretty much caught up on all the "busy" work around the campground and the office.....we are in sort of a holding pattern until Thursday when things will begin to heat up once again. It is difficult to believe that by the end of Tuesday one week from today we will be almost 300 miles north and west from our current location where our Newell has not moved an inch since May 17th. Over the next 3+ months we will cover just under 2,000 miles and added a treasure trove of new memories. As much as I like getting off work at 4 pm, getting up at 5:30 am to be at work by 7:30 am so I can get off work at 4 pm never, ever gets any easier. As of Monday we had 5 work days left, and when we finish at 4 pm on September 1st we will have worked exactly 30 days out of the 3.5 months we have been in residence at TVC. Monday was our 2nd to last Monday here at TVC and SLT, and was a reminder how fast time is now moving as we are within a week of our departure date. The day began slowly, and remained pretty slow. We only had like 17 arrivals scheduled for Monday, and all but 3 of them had arrived by 4 pm. I spent most of my day outdoors in the golf cart checking on the daily departures, and urging along those who were inclined to tarry too long in their sites. I totally get why they do......who wants to leave Lake Tahoe? We had a few requests for late checkouts, including one group of young people who were overnighting here on their way to "Burning Man". Monday was the official opening day, and they needed a little extra time to get ready to head out to the desert. Around 10 am we received a call from someone advising the entrance to "Burning Man" would be closed the rest of Monday, and into late Tuesday afternoon (possibly even until Wednesday) due to monsoonal type rains, and flooding at the site which had made moving vehicles in and around the "playa" impossible. As soon as I got the news I headed back to their site to let them know and fortunately caught them before they had left. They opted to remain here at TVC for one more night, but by 6 pm I'm sure they were wishing they had gotten a motel room. The outside temp was actually quite cold until about 2 pm....probably low 60's with intermittent cloudiness....and I was still wearing my polartec jacket at 2 pm. For those of you who may be inclined to "sneer" at my wimpiness, just ask yourself this question.....would you rather be in a place in late August where you might have to put on a jacket on occasion, or someplace where it is 95 degrees and 95% humidity, and the thought of any clothing touching your sweat coated skin is repulsive? We watched Masterchef, then Hotel Hell, and were in bed a little after 10 pm with rain still ratatatating on our roof........happy that we had a roof of aluminum over our heads, and not a mostly waterproof tent fabric. Sunday never felt like Sunday to me.....it felt like a weekday all day long. As we drove into Carson City on our single day off between workdays I would see businesses closed, and wonder why for a brief moment before I remembered it was Sunday, and tire stores, auto repair, etc. are rarely open on Sundays. Why were we driving to Carson City on Sunday you might ask? Well, we have this large pile of "stuff" we needed to donate to a thrift store, and all the local thrift stores are for profit, and we wanted to donate this pile to a charitable one, so we chose the Goodwill store in Carson City as the recipient. Of course, that was not our only reason for the long drive....we needed to make one last Costco and TJ's run, and I needed to get a haircut that would last a couple of months. Our first stop was the Smith's in Dayton, NV.....almost 41 miles away. They have one of the cheapest diesel prices in the area by a lot, and we will be filling up our tank in a little over a week. Smith's is part of Kroger, and we had some fuel points about to expire so we wanted to check out the station in person for ease of access for the Newell, and use the 20 cents off a gallon that was expiring to fill up the Beetle. We ended up paying $3.69 per gallon ($3.89 less the 20 cent per gallon discount) for 91 octane.....the best we have paid in almost a year.....and the station is perfect for the Newell and trailer. It is a little out of the way, but we will be taking on close to 150 gallons in diesel. The current price there for diesel is $3.69, and we hope to get up to a 50 cent discount per gallon on the first 35 gallons by the time we arrive next Tuesday morning. From there we back tracked to Goodwill and dropped off my old golf bag, a beach umbrella, a couple dozen paperback books of TLE's, our old DVR, a small bike rack, a folding chair, and an old tent. All that stuff pretty much took up the back of the car with the rear seat down. After we finished our donation we went inside to find what we could find that we might not be able to live without. TLE found one pair of jeans, and I found a "sand wedge" for for my growing golf club collection.....that was the one missing clubs in my bag, and I do find myself in the sand traps from time to time when golfing. I think we showed remarkable restraint, don't you? Then it was over to Supercuts to get my 2 month haircut.....yeah, it's pretty short right now.....then on to TJ's and Costco......by this time it was closing in on 1:30 and we had not eaten lunch yet, so before we hit TJ's we stopped for our last In-'N-Out burger before heading to the Oregon Coast for two months. At TJ's we stocked up on wine, scotch, carne asada, and pollo asada. There will be one more TJ's coming up as we pass through Medford, OR next Wednesday, but I think we got a good start. Then we stopped at Costco for 2 of everything......2 rotisserie chickens, two bags of our favorite coffee beans, and 2 bottles of Kirkland (Costco brand name) pre-mixed margaritas. We then headed back up the hill into the Tahoe basin......usually after the car has been sitting in the sun at Costco the outside temp reads pretty high, like 107 yesterday (it was not really that hot in Carson....maybe high 80's, low 90's), and it's fun to watch the temperature drop rapidly as we head back up to Spooner Summit and 7,000 feet elevation....in just 9 miles it dropped from 107 down to 81. We made one more stop at Dart's Liquor (Stateline) to get some of TLE's favorite potato vodka, and for me to buy some Shake Choclolate Porter......hmmmmm, apparently I'm not the only one who likes it, because there was only one 6 pack left....drat! We were home by 3:30, and had all our spoils put away by 4, then it was time for TLE to break down the two chickens, and freeze them for future use. We ate around 6, and around 7 headed over to Ray and Carol's site for one last fire before the hectic Labor Day week begins......we had a great turnout (John and Deb, Ray and Carol, John and Becky, Mel and Marilyn, and Billy and a female friend. Billy is quite a guitarist.....well, quite a musician, as he plays many instruments....and he spent about an hour playing and singing a number of songs for us. It was a classic evening around a great fire with good friends. TLE and I headed home about 9:30 as we open the office Monday morning and need our beauty rest.....well, I need it.....TLE always seems to look great no matter how much sleep she gets......:-). The SLT* weather has been idyllic these past 2 weeks, and as I mentioned yesterday, there is this crispness to the morning air that reminds me of Autumn. This is the kind of weather I could get used to on a long term basis. The park continues to be relatively quiet and empty compared to weeks previous, but we know that August 29th, the beginning of the Labor Day crush, we will have 200 arrivals that day alone. I'm sure many will decide to extend the long weekend by arriving on Wednesday and Thursday. At any rate the park is completely booked except for a few lonely tent sites. Our day # 25 in the office began at 8 am, and as Saturdays go this one was very tame. I spent most of my day outside the office doing site checks, and continuing to finish the work we began a few days ago to bring the Storage area up to snuff, and by the end of the day Saturday we had gone as far as we could go.......I think we are in pretty good shape now. TLE and I were off by 4:30 and on our way home.......only 5 more days in the TVC** office and we are free to begin rolling our wheels again. I write that with some sense of melancholy as we really, really are enjoying our time here. Nevertheless, if we stay much longer we will be in jeopardy of losing our "Nomad" card......seriously, there really is no "Nomad" card, I'm just being silly. My point is there are still so many places to see, and people to meet.....we have only just begun to scratch the surface of this nomadic experience. It is time to get on with it! Around 6 I grilled a filet mignon on the Sea-B-Que to which TLE added baked potatoes and a nicely dressed salad. The steak came out perfectly at medium rare! Afterwards we headed out on a walk around the campground, which we have not done now for a few weeks. As we walked we stopped often to talk with many of the new friends we have made since we arrived back in May. It has been a great summer, and the next two months as we head into autumn on the Oregon coast promise to be just as magical. Before we began our nomadic wanderings we used to say Lake Tahoe was our favorite place to be, and it is still #1, but after two visits to Cedar Key back in 2012, it is now a toss up between the two. Who knows what new place may capture our imagination over the next year? I love waking up on a Friday morning knowing I don't have to go to work......I just do. My "like" increases in intensity when there are fun projects to work on during the day. I'm not being facetious when I use the word "fun". Since I have retired I have more time to work with my hands, which I enjoy immensely. Our departure date is rapidly approaching which means I need to finish a number of smallish projects before we leave. The first project of 5th Saturday was the installation of the new PAW 1500 watt electric heater I purchased from Amazon to replace the now 32 year old one in the bedroom. Since we have been using our heaters much, much more than the AC this summer I had begun to notice a slight "rattling" sound coming from the old girl, and knew I would just be rolling the dice if I waited much longer to replace her. As it turned out Amazon had dropped the price of the heater about $12, so I ordered one immediately and it arrived within 2 days via Amazon Prime......as always. The old heater was 12.5" X 4"......the new heater is 12.5" X 6", so I used my jigsaw attachment for my drill and enlarged the opening. That was the hardest part mainly because I had to fit my body into a small space to do the installation......I don't fold up as easily as I once did. Next up was the rubber "diamond plate" veneer on the trailer ramp door. Over time it has shrunk a little and pulled away from the aluminum strips that hold it in place around the edges. The sun is a perfect solution to this problem, and Friday we had plenty of it. I just lowered the ramp door down and let the sun heat up the rubber while I removed the aluminum strips. Once the rubber heated up it was easy to stretch it back to its proper dimensions and then re-install the aluminum strips to hold it in place. As a precaution I doubled the number of screws being used, and I hope that will last a while this time. The final project of the day was to install the new (slightly used) bike tights for my mountain bike, and that of my grandson, Elijah. I bought the K2 bike off Craigslist for Elijah to use while he was here visiting, thinking I would either part it out on eBay after he left, or donate it, but he fell in love with the bike. There was no room in the car to take it home so I promised to hang on to it and and bring it to him when we arrive home for Christmas. That promise necessitated the installation of a bike tight to hold the bike in place while we travel. Of course there was the requisite nap in between projects, lunch and a little reading, but I finally finished all three projects around 4:30.....by then I was one filthy boy, so I jumped into the shower to wash away the dirt. Around 5:30 I started the BBQ to grill the Ahi Tuna TLE had purchased while doing a "BIG" shopping a Raley's. She earned another .50 cent coupon for up to 30 gallons of fuel.....we'll use that a week from Sunday (August 31st) to put 30 more gallons of diesel in the tank at $3.59/gallon. Then we'll head on Tuesday (September 2nd) over to Dayton, NV where diesel is only $3.69 per gallon compared to the $4.09 here in SLT. We'll stock up on food at Smith's hoping to earn another .50 cents off a gallon of diesel before we top off the tank for our trip up to Oregon. This next tank should take us to Oregon and back to Fernley before we need to fill up again. We haven't had to fill the tank for 4 months now, and the next time will be another 2 months. TLE cooked up some baked potatoes and asparagus for our dinner which was accompanied by a Coastal Zinfindel from the wine closet. And that capped off another great 5th Saturday. We started off 4th Saturday with TLE doing a DEEEEP cleaning of the coach interior while I concentrated on bringing some order to the mild chaos in the trailer. When you sit in one place for a long time a lot of stuff comes out of hiding. 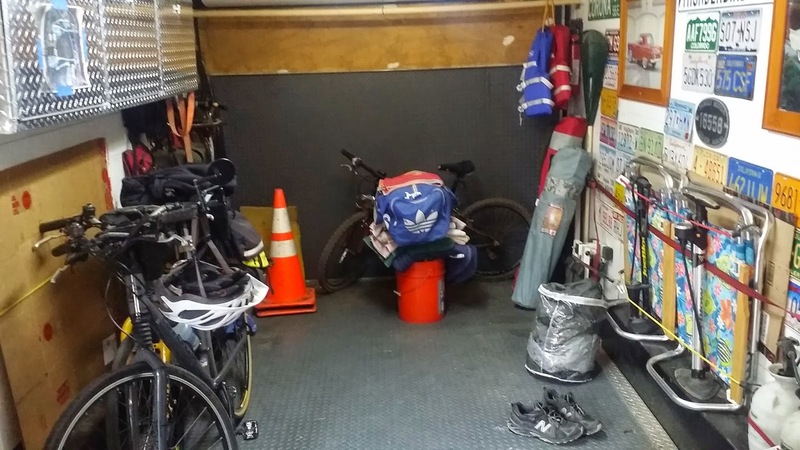 Then you throw in the occasional gratuitous purchase of some needful items and suddenly your trailer and/or coach begins to look like a hoarder has taken up residence. This is the ongoing tension that is part of the nomadic lifestyle. There is only so much storage space. Once you reach critical mass (every square centimeter has something in it) you must begin to make hard decisions.....if you are going to buy that new "needful" thing what are you willing to remove from the trailer and/or living space to make room for it? If you don't make those hard decisions pretty soon you will find yourself driving down the road holding that new needful thing in your lap, or, maybe if you've been particularly sweet that day your spouse/partner will agree to hold it in their lap. The moral of the story is don't wait until 12 days before your departure date to make those hard decisions! It took me the better part of the morning, and into the afternoon to get the trailer organized.....I put away my "Workmate" (portable work bench by Black and Decker), the tandem, a few of the camp chairs, and created a pile of items that did not make the cut to remain in the trailer......a beach umbrella, one camp chair, a small car bike rack, and the extra golf bag.....I'm sure there will be a few more items added to the pile Friday, then we'll make a run to a local thrift store and make a donation. I also unpacked our new awning mat, and the new bedroom heater that I'll install on Friday. By 1:30 it was beginning to get a little warm in the trailer so I had a meeting with myself and decided it was time to take a break for lunch (left over pizza), and maybe read a little in shade of the patio awning, which is precisely what I did until I got a call from our mechanic (John) over at Higher Ground Autoworx around 4 pm advising he had finished the work on the Beetle, so I hopped on my Badboy and made my way over to pick up the car. As it turned out the work (new brake pads, rotors, oil change, new oil dip stick and tube) cost about $100 less than I was expecting. We chatted for about 15 minutes about some more minor stuff that we will take care of next summer when we come back to SLT, and then I was on my way back home. 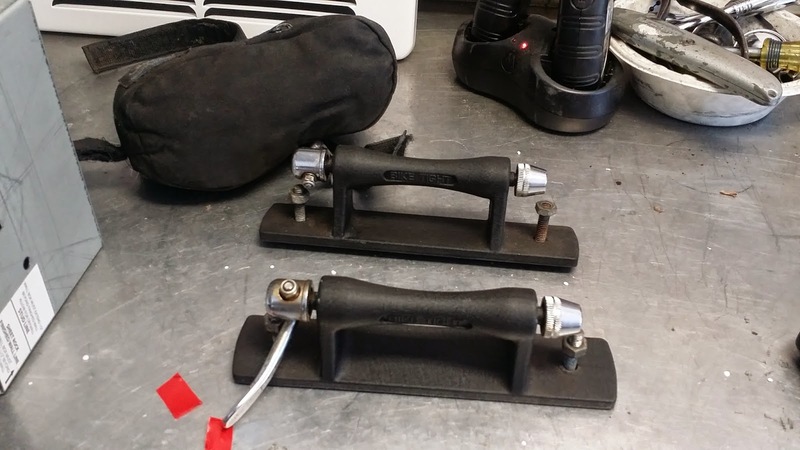 I stopped off briefly in the TVC office to pick up a small package containing two "bike tights" I bought on eBay to mount my Intense MTB, and my grandson's MTB. Previously I used part of my old Yakima bike rack to secure my Intense MTB, but I sold that so hence the need for the bike tights. Around 6 we had dinner (chicken on a bed of rice with zucchini and broccoli), then headed outside for a fire where we were joined by Deb and Johnny for about an hour.....looking forward to 5th Saturday and getting more "stuff" done. So, I was thinking yesterday that we have been here at TVC* for just over 3 months and were working just our 24th day during that same stretch. Seems like a pretty good work to leisure ratio doesn't it? Somewhere just north of 2 days off for every day worked. For the first time in our travels I'm not getting totally "itchy" to begin moving again. Don't get me wrong, I'm totally looking forward to spending two months on the South Oregon coast with friends, and all the new experiences that will follow, but I'm really content to be where I am, doing what I'm doing. If someone came up to me today and told me I have to stay one more month in South Lake Tahoe I would probably reply "Cool". Both TLE and I feel pretty much the same way about our time here......our experience over the course of the summer has completely exceeded our expectations. Once again we can say we have made some great new friends, and are already looking forward to spending time with them again next summer. Before our work day started I drove our VW over to Higher Ground Autoworx to get the oil changed, the front and rear brakes renewed, and a new oil dipstick and tube. John will have the car a couple of days, so we'll be walking and biking during that time. I put my Cannondale Bad Boy on the new Kuat bike rack with which I have this ongoing love affair. I dropped the car off at 7:10 am, dropped my keys in the drop box, and then rode my bike back to TVC.....I was back at the trailer by 7:25 where I put the bike away, and then arrived at the office at exactly 7:30 ready for another day. As I walked over to the office I noticed there was a definite crispness to the morning air......it's beginning to feel like autumn to me. Frankly, I think we were a little over staffed for Wednesday's workload. We only had 17 arrivals, and around 24 departures, so Duane (our manager) gave each of us work assignments that would help get things better organized for when things heat up again next week. I spent the entire day, much to my delight, in the golf cart going meticulously through all 406 RV/tent sites and around 46 storage sites to verify that every site we supposed was empty was really empty, and all sites we supposed were occupied really were. Of course we are still dealing with two golf carts that between them might run a combined 3.5 to 4 hours, so I was having to return to the office every one to one and a half hours to plug in the cart I was using to plug in for a while to be sure it didn't die somewhere out in the park. I finally finished with the last section ("A") around 2 pm and then began to work on making some sense out of the storage area. Bill (of Bill and Debby's Wild Ride) had spent a lot of time this summer getting our office paperwork to line up with what was in the storage yard, and did a really good job at creating order out of total chaos, but there was still some work to do making sure every RV in storage had a tag that was legible, and that every tag was placed in a similar position on each RV so that anyone driving a golf cart down the dirt isle could easily verify and read every tag at a glance without getting off the cart. 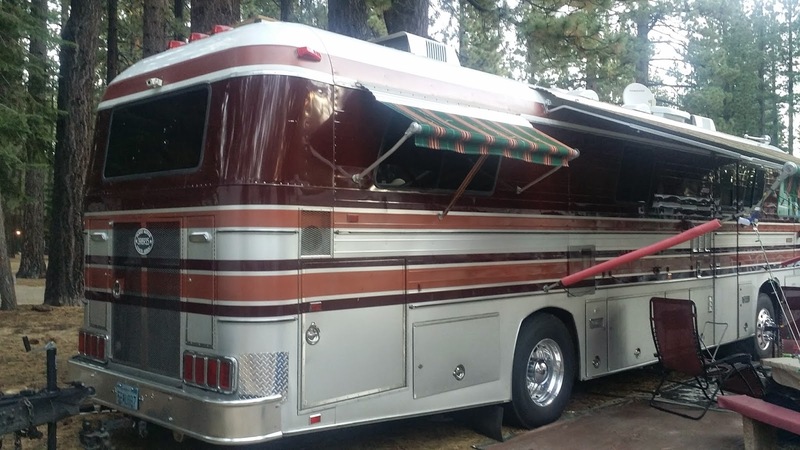 Now, the next project is to chase down those few who have expired tags by calling them to find out when they are coming to either pay what they owe to bring them up to date, or pay what they owe and remove their RV. Most of the tags are current, but there are a few that expired back in June, July and early August that need resolution. TLE and I both punched out at precisely 4 pm, and headed home to take a short rest and consume a couple of Margaritas before walking over to Lake Tahoe Pizza for dinner. We ordered our usual Jackpot Pizza with anchovies on one side for me......TLE likes anchovies, but not as much as I. It was Icky IPA for me, and an ice tea for TLE. We were back home by 6 where I took a much needed nap before we watched the current episode of "So You Think You Can Dance" followed by "Motive" and then off to dreamland for both of us. Everyone says the same thing.....we are in the "lull before the storm"....what storm you ask? The looming storm will be the tens of thousands of people who descend upon South Lake Tahoe, and specifically Tahoe Valley Campground as our nation celebrates the "Day of Labor" long, long weekend......the last big blowout of the summer for the workaday world. How bad will "it" be? I have no idea.....it can't be worse than the 4th of July weekend, can it? Well, however it turns out we are going to live in the present and enjoy the more laid back atmosphere of TVC this week.....I'll think about next week.......next week. TLE and I ambled over to the TVC office around 7:25 to open it for yet another day of commerce. We struggled a little bit with the door lock, but it finally submitted to our wishes allowing us to gain entrance. Whilst TLE deactivated the alarm system I backed the office golf cart out of the entry way, and then re-secured the doors until opening time at 8 am. The one thing I am enjoying about opening the office is that we get off at 4 pm......the day just seems to go faster, and Tuesday was no exception. Our arrival list, for the first time since we have been working, was less than one page long, and the same was true for the departure list. A few days ago I ordered a new awning mat, which arrived while we were down in Mammoth Lakes last weekend, and the replacement electric heater for the bedroom I ordered arrived Tuesday afternoon. We replaced the salon electric heater in April of 2013 when we were visiting our friends in Huntington, WV, and knew it was just a matter of time before it would be time to replace the one in the bedroom......but it just keeps on working, so finally I decided to be proactive, and order the replacement so I could install it at my leisure. The next one on the list will be the water bay electric heater. Both items were ordered through Amazon Prime, and both arrived within 2 days (free 2 day shipping) of being ordered online.....we love Amazon Prime! By 4 pm we had clocked out, and were on our way home.....just 7 days of office work remaining before we head north to the Oregon Coast. 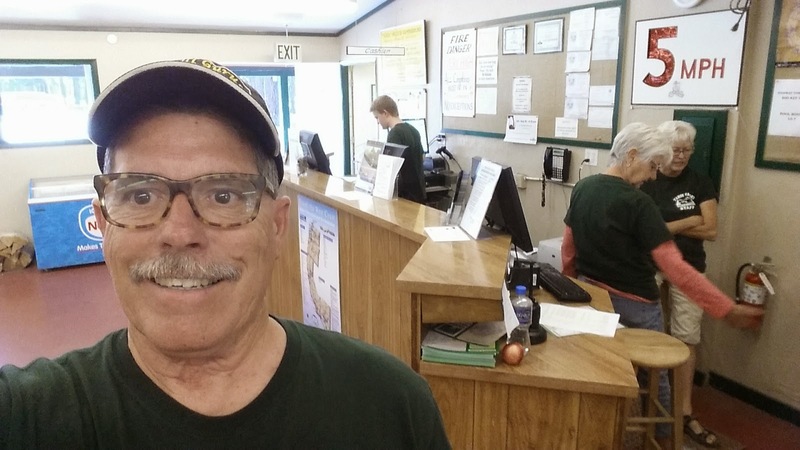 Our friends (Chris and Cherie) with whom we will be working at Cape Blanco Lighthouse, are gradually edging their way west and are now in Idaho. Paul and Nina are currently spending a month on Orcas Island, and will be heading south in a matter of a week, or so where we will all convene for 2 months of coastal living just north of Port Orford. Wednesday I'll run the VW over to Higher Ground Autworx to have the brakes done, and the oil changed......then she will be just about up to snuff again. TVC Office - Day # 22 - "Don't know where you find the time!" Michael, a friend from our first stint at Amazon.com in Campbellsville, KY, wonders where I find the time to put words on a page each day. If I didn't sit down at my computer first thing in the morning, every morning, to write this blog it would not get done. I wonder almost every day "what will I write about today? ", and even as I am typing now I am wondering what the fruit of today's meanderings will be. I don't consider myself a gifted writer......like many endeavors in my life I have to work at it.....every day it seems a struggle, but somehow in about a 30 minute stretch each morning I manage to arrange enough words on the screen that make sense. Two years, in October of 2012, ago I started blogging every day when we arrived in Campbellsville, KY to start our Amazon job. Up until then I had only been writing an entry when we were moving every day, or had done something I thought might be interesting to others. It was when we arrived in Campbellsville that I began to realize that our very life on the road, and how we coped with every day things "on the road" was interesting to others. My goal at the time was to chronicle our Amazon experience in an honest, forthright manner not only as a historical record for my future reference, but for others who might be considering a temporary position at Amazon. Since that first day I have not missed one single day....even when I was in the hospital recovering from double hernia surgery. Obviously, after this many months of building this habit it has become a little easier, but I am finding this stretch in SLT my most difficult time in my "blogging life". When you sit in one place for almost three and a half months there is repetitive quality that begins to seep through. My daily struggle has become how to make one day in the TVC office seem different from another, and/or remotely interesting. So, here we go....day # 22 in the TVC Office.....well, Monday was our first day opening the office.....errr, well, it was TLE's first day opening the office....I was just along for the ride. My only task was to turn my computer station on and get ready to provide customer service. We arrived at the double glass doors just before 7:30......just about the same time Billy and Sandy arrived. Even as we scurried about the office getting ready to open at 8 am there were already people appearing at the locked doors wanting in.....some wanted coffee, which we had just started brewing, and others wanted the aforementioned customer service. This is our first time working on a Monday, and I kind of liked the laid back nature of the entire day......all the hectic office work had happened on Saturday, and Sunday. The list of arrivals for Monday was very small, and the list of those leaving only slightly larger at less than 50. I helped Deb work on straightening out the RV storage area, which has been an issue all summer. The flow of customers was pretty light all day, but we managed to keep ourselves occupied in a somewhat profitable manner. I did my "site check" rounds over the course of the day.....the first round about 9:30, and then back out after lunch break to be sure those who had not yet departed in the morning were now gone. In my spare time I typed up a very short 4 point instructional sheet on how to use the Tengo Internet WiFi here in TVC. This will be especially helpful on days were the office is being "slammed" by customers, and there is little, or no time to help people get on line. We were both off by 4 pm, and on our way back to the coach....we now have less than 2 weeks until we depart, and it almost seems surreal that our time here is rapidly coming to an end. "Sunshine on my shoulders makes me happy......"
Tim and Laila joined TLE, Brenda and I for breakfast Sunday morning......the girls cooked up some of the left over Mexican food into the scrambled eggs.....it was a great breakfast! Then it was time to think about getting dressed to go riding one last time on this trip. In another life time, back in the mid 70's, I remember getting off chair # 9 at Mammoth Mountain on Christmas day at the very beginning of a beautiful, windless, cloudless ski day. A John Denver song was playing over the loud speaker at the top of that chair lift......"Sunshine on my shoulders makes me happy"......as I stood looking toward the Minarets Sunday morning (a scene I have seen in both summer and winter many times over the years) with the sun on my shoulders, I was thinking of how that view, and that sun hitting my shoulders out of a clear cobalt blue sky, just made me feel at peace, and very happy. I could still hear the refrain of that song echoing in my memory from so many decades ago. Sunday morning Paul and Mark decided they would go fishing before heading home, and Richie headed home with his wife and son.....they had arrived early Friday morning and had already ridden 2 days, so it was just Brenda and I who headed down Canyon Blvd. to the Village to pick up the first shuttle of the day at 9:30 am. Frankly, I was a little bit beat after the 32 miles we had ridden Saturday and would have been just as happy to sit at the condo drinking a second, and maybe a third cup of coffee. I guess, ultimately, it was the thought of gazing upon that long view one more time, and maybe the fact I had bought a two day ticket that finally got me motivated enough to get dressed and ride. .....to think we have been waiting all summer to see bears at South Lake Tahoe, and to see them we have to drive 150 miles south to Mammoth Lakes! Brenda and I finished our 14 mile final ride with our usual Big Ring trail competition to see if we could do it one more time without pedaling, and we both did. We were back at the condo loading our bikes on our cars by 11:15.....in all we covered 46 miles of downhill over two days. Within an hour after our one run of the day Brenda was on her way back to SoCal, and then Paul and Mark returned from fishing and were gone in a few minutes, too. As always, I do not look forward to saying "until next time", but this time it will only be a short few months until we are back in SoCal with them for a month, or so. Tim and Laila followed us into town where we dropped off the condo keys at the rental agency, and then headed over to John's Pizza Works to have lunch and say our "until next times". It was so great to see Tim and Laila this weekend. Here are a few pics of our time together. Then it was our turn to make our run back north to SLT and our last two weeks at Tahoe Valley Campground. We left Mammoth just before 2 and were home by 5, even with a quick stop at TJ's in Carson City. We now have 9 work days, and only 6 days off left in our sojourn here.....WOW, where has the summer gone? We started off real Saturday with scramble eggs, bacon and toast courtesy of TLE and Brenda, then gathered ourselves together (those of us who were riding) and rolled our bikes down to the parking lot to get our riding gear out of our cars. One thing I love about staying in the Silver Bear Condos is we just hop on our bikes and ride a mile downhill to the shuttle, and then up to the Mammoth Mountain Adventure Center. We don't have to drive anywhere. At the end of our riding day we just exit the trail above the condo and essentially (there is a short uphill) coast down to the condo parking lot. We began our first downhill run of the day around 10 am at the top of Mammoth Mountain......11,053 feet in elevation. It was a cloudless day, no wind, and a magnificent view of the Sierra Nevadas in every direction. On this day, unlike our first day on our last outing, there were no mechanical issues. We just rode and rode and rode.....finally covering just over 22 miles before we arrived back at the Village and the shuttle. By this time it was 12:30 and time for lunch, so we opted to eat lunch at the Lakanuki Tiki Bar.....Yelp gives them 2.5 stars, and I don't know why.....we have eaten dinner here once, and lunch a couple of times and all three times the food and service were above average. We would give them a 3.5 to 4.0 without hesitation, and Saturday's lunch experience was no exception. TLE met us there for lunch as well as Richard's wife, Gloria and their son Richard Francisco, so we had quite a crowd. I had the Blackened Fish Tacos, which were cooked to perfection. 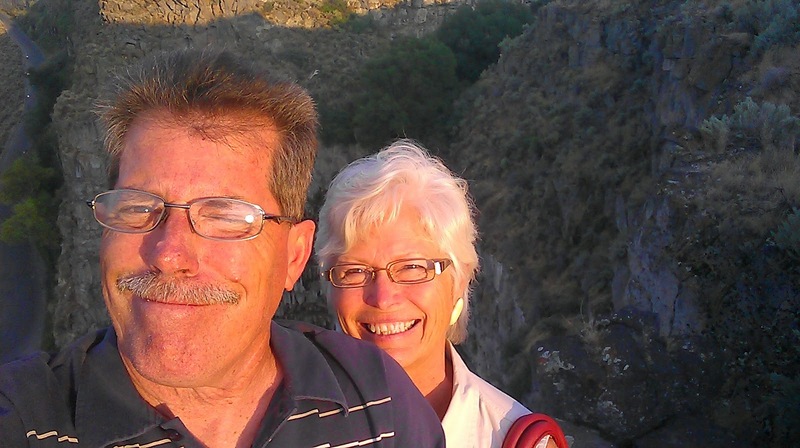 I have been riding mountain bikes with Paul since 1994, and with Brenda since 1999, and Richard since 2004. I could not ask for better friends......not only for mountain biking, but just as friends in general. Being able to meet up with them twice this summer has been pretty special, and that I can still keep up with them is just as special to me. We all used to ride a lot faster than we do now, but after a few bad crashes over the years we have all learned that we can have just as much fun without shedding any blood, or breaking any bones.....I guess that would be called "maturity". After lunch we all (except TLE) boarded the shuttle once again for the ride up to the Adventure Center and a gondola ride back to the top. TLE spent her afternoon browsing through used book stores, and a thrift shop, or two. Brenda, Richard and I had decided this would be our last run of the day, so we rode with Paul and Mark back to the adventure center and then bid them adieu as the three of us continued on our last ride of the day which would put us at 32 miles total for the day.....that's the first time I've broken 30 miles in one day in a long time. Our last trail of the day is called "Big Ring"......we always have a competition to see who can ride the entire 4 miles of trail without pedaling, or "dabbing" (touching the ground with our shoes). I managed to do it for the first time in years. Back in the late 90's Paul and I set out one day to do 100 miles, which was nuts. I called it a day at 72 miles after breaking three spokes on my rear wheel, and Paul made it all the way to 96 miles before calling it quits. Those days are gone forever now as we are about 20 years older, grayer, and maybe a little wiser. For all of us Mammoth Mountain Bike Park holds a lot of wonderful memories, and camaraderie stretching back many many years. We arrived back at the condo around 4 pm where TLE and Brenda quickly made up some Margaritas for us. Around 5 my son, Tim and his girl, Laila, arrived. We, of course, haven't seen them since we left Riverside back in March, so it was really, really good to see them. Around 6 we drove down to Gomez' Mexican Grill for appetizers and a couple of pitchers of Cadillac Margaritas. Paul and Mark eventually joined us (they rode 20 more miles after Brenda, Richard and I called it a day) and then Richard, Gloria and Richard Jr. arrived as well. We spent a couple of great hours laughing and talking and just enjoying the company of good friends. We'll make a run, or two first thing in the morning (Sunday) and then begin our trek back to our respective domiciles. I really wanted to start our trip south to Mammoth at 9 am Friday just as I did on my last trip, but the baby must have new shoes, and that necessitated leaving in the afternoon.....during the height of traffic congestion in South Lake Tahoe. TLE and I busied ourselves with getting ourselves packed up and ready to go, and then I drove the Beetle over to Ken's Tire Center just before Noon to get the new "shoes" installed. As I expected, the truck delivering my tires had not yet arrived at Noon when I arrived, but I was prepared to wait it out with my Kindle. 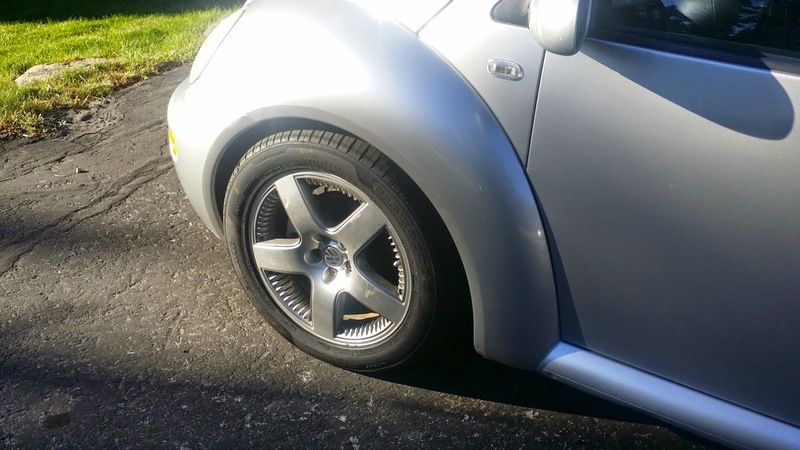 The service manager had the wheels removed from the VW in preparation for the arrival of the "late" delivery truck, so when the truck arrived just short of 1 pm all they had to do was mount the new tires on the rims, and then put them back on the car. As they finished up I sent a text to TLE letting her know I would be home shortly, and she replied she was "ready". I was home by 1:35, and we were on our way by 1:45. It is only about 26 miles to Gardnerville from SLT, but it took us over an hour to drive that distance due to the heavy traffic, which I had feared would be the case, and the on going construction on HWY 207 over Kingsbury Grade. Once south of Gardnerville it was smooth sailing, and we were in Walker, CA by 3:30 where we stopped at Walker Burger for a very late lunch. I've driven by Walker Burger a dozen times over the years, but have never been inclined to stop, but this time hunger made it a necessity. 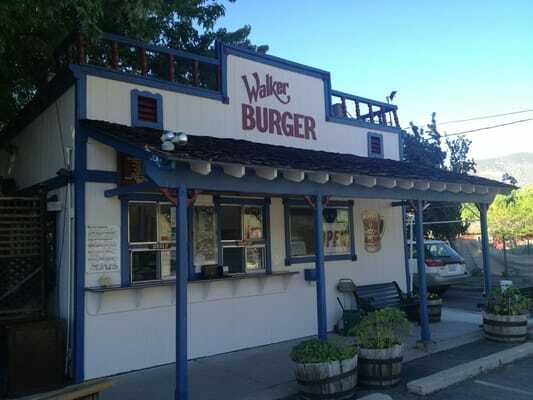 Yelp gives Walker Burger a solid 4 stars on 65 reviews, and we would both have to agree. They have a nice outdoor dining area covered by shade trees, and the operation is well run from top to bottom. I had, of course, the Walker Burger with cheese, and TLE ordered a large portion of fries....we both had shakes (vanilla for TLE, and chocolate for moi). We ate a leisurely lunch and were back on the road by 4 with about 80 miles to go.....the rest of the drive was uneventful, and I really began to appreciate the new "shoes" the Beetle was wearing......a little higher profile than the old "shoes", and a noticeably smoother ride, plus I think a little better mpg than previously. We arrived in Mammoth Lakes just around 5:15 at the condo we rented for the weekend with our good friends from SoCal.....Paul, Mark, and Brenda. 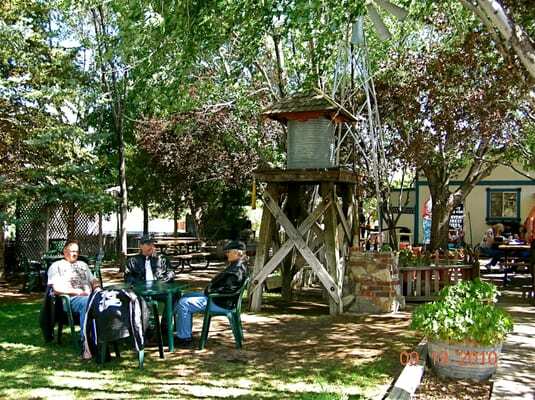 Our other friend, Richie, is staying with his wife, Gloria, and their year old child down at the Shilo Inn, and will join us for our ride on Saturday. When we arrived Paul and Mark had gone fishing, so TLE, Brenda and I drove over to the Charthouse Restaurant for apps and drinks.....we were both still full from our late lunch. By the time we returned Paul and Mark had returned from fishing and were heading out for a late dinner.....Brenda decided to join them. They were going to eat at the new Mammoth Brewing Company (located in the old Whiskey Creek Restaurant), but found out upon arriving at just before 8 pm that they #1 did not serve food, and #2 had just announced "last call".....who has a last call at 8 pm in a resort town on a Friday night? Anyway, they decided to head just up the street to Toomey's for dinner, but experienced the worst service imaginable. Yelp gives Toomey's a solid 4 stars, but I noticed a review posted just a little earlier than our friend's visit describing the same bad service, however, on 389 reviews they get a solid 4 stars. Maybe it was just one night, but first impressions are everything.....I don't think they will be back for "seconds". Paul, Mark and Brenda arrived back home as TLE and I were watching a movie on Netflix starring Jason Statham called "Redemption"....it was not a memorable movie, and soon we were all talking about this and that while the movie played in the background. We were in bed shortly after 10 pm dreaming about about our mountain bike adventures to come......thanks for stopping by! 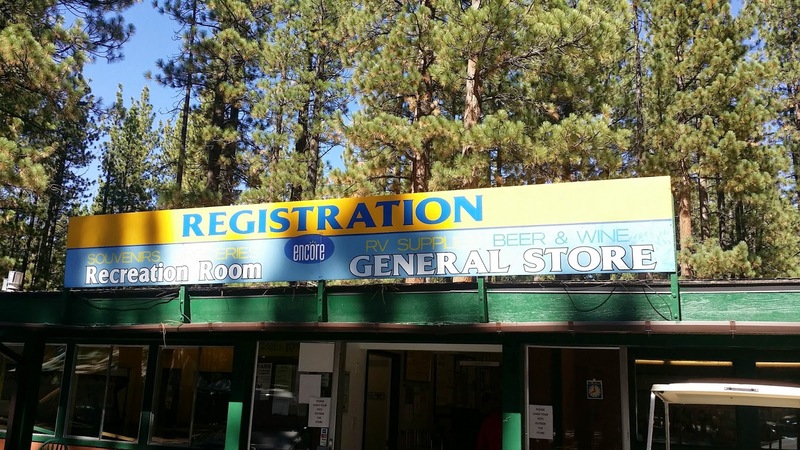 Before I get into Thursday I need to back up one day and relate our experience at the South Lake Tahoe DMV (Department of Motor Vehicles). When I last left off on Tuesday we had a 10:10 am appointment on Wednesday to renew our driver's licenses for 5 more years.......geez, that means we'll be 70 the next time they're up for renewal! We arrived a little early for our appointment at 9:50 am to find the DMV relatively devoid of patrons. We are used to the DMV's down in SoCal where the line is already out the door by 10 am, and all your appointment does there is get you in the door to wait in the next long, long line, and regardless of what time your appointment is for you can count on at least an extra 45 minutes to an hour before you get an audience with a DMV employee. This day there were fewer than a dozen people waiting to be served. As it turned out we were called at 10 am for our appointment and after transferring $33 each to the DMV we were done, and out the door by 10:20 am. I have to say other than renewing by mail, this was the most pleasant interaction we have had with the DMV in our entire lives. Fourth Saturday started off sweet, and just got sweeter. Some days everything just goes your way. I was in the VW at 8:45 on my way over to Lilly's Tire Center to get the two remaining locking lug bolts (I called them lug nuts previously.....they are really bolts) removed. George directed me to park over by the air compressor, and within 5 minutes both of the offending lug bolts had been removed....WOW! From there I drove 4 blocks to the local O'Reilly's Auto Parts store and bought two regular lug bolts, and was home by 9:30 installing the new lug bolts. TLE decided to tackle the re-organization of our basement through storage space to make better use of it. She is really good at spacial stuff, and already had some ideas of how to repack everything, and make room for a few more things we have acquired during our sojourn here in SLT. By 11 am she had finished, and we now have soooo much more room in our basement through storage. The weather was so nice we decided to pack a lunch, and ride our bikes over to the "Commons" at Lakeview and Tahoe Blvd. where we have gone a couple of times previously. It is just a 4 mile bike ride to the "Commons" and we were there before Noon. Surprisingly, the crowds had not yet arrived, and we were able to get a picnic table with a great view of the lake. Sitting at the beach here at Lake Tahoe has been one of my favorite things to do since I was a little boy, and the view of the lake here at the "Commons" is one of my favorites. When I see that view I feel like I have come home.....it's as if time has stood still all these years and I'm 6 years old again seeing it for the first time. The air is so clear, and the horizon is so defined. We spent a couple of hours eating our lunch, and then reading before deciding it was time to begin our meander homeward. On our way we hit a couple of our favorite thrift shops, and at The Attic I found an almost brand new golf bag with "legs" for $6! By "legs" I mean you can sit it down on the ground and these two legs extend to keep it upright. Just what I have been looking for......I know I haven't really played any golf since we have been here other than hitting a bucket of balls, and putting on the practice green, but I'm now ready to walk the course! We got home around 3:30 and sat outside reading for another hour or so before it began to cool off. I think the forecast temperature was 81, or 82, but I don't think it got much past 78 on Thursday. I've noticed it is also getting much cooler at night again. Thursday night there were a few more pre-season NFL games on TV, and I watched part of the Chicago Bears and Carolina Panthers game with the sound muted while 60's music played in the background on our XM radio.......it was a magical day where everything fell into place from beginning to end. Friday we'll get the new "shoes" on the Beetle, then head 148 miles south on HWY 395 to Mammoth Mountain for the weekend......YAY for us! TVC Office - Day # 20 - Wooooosh! TVC Office - Day # 19 - Can you Tengo? TVC Office - Day # 17 - Batman Lives! !